So it’s the last day of August, summer is winding down, and I’m not really sure how I feel about this. Part of me can’t wait for fall, but part of me wants to hold on to summer for as long as I can. Pumpkin recipes have started popping up all over the place, and I know that comfort food season is just around the corner. I may have gotten a bit overly excited yesterday when I found out that pumpkin coffee is back at Dunkin Donuts, and for the past week my Michael Kors boots have been eyeing me every time I go in my dressing room! However for the rest of this week and weekend I’m holding on to summer, and I’m going to try to get in as much pool time as possible. This is also the last day of National Goat Cheese Month. I think by now you all know how much I LOVE goat cheese! First there was the Strawberry Goat Cheese Blondies, next was the Goat Cheese Ice Cream, and now Blueberry Goat Cheese Cheesecake. This cheesecake is the perfect dessert to wrap up summer. The cream cheese makes it super smooth while the goat cheese adds a zip of tartness to it. I also find that the goat cheese makes it a bit lighter which is perfect for the weather right now. The addition of blueberry jam makes it scream summer with its bright flavor and phenomenal color. The last thing I added was Amaretto to dress it up. It really enhances the flavor of the almond crust beautifully. The great thing about this cheesecake is that you can change it up. You can use any type of jam, liquor, and nut that you like. There are so many possibilities! I also hope that you’re not sick of goat cheese yet because I have a lot more ideas swirling around in my head that I can’t wait to share with you! Mix graham cracker crumbs, almonds, and sugar in food processor to mix. Add in melted butter & pulse till it comes together. Press mixture into a 9″ greased springform pan. Mix room temperature cream cheese and room temperature goat cheese in mixer on medium speed. Add eggs, egg yolks, and vanilla extract on low speed. Add sour cream and blueberry jam. Remove springform pan and serve. The good think is that I can have any sweet I want once a week!! This cheesecake will be in my favorite list… Thank you for sharing! 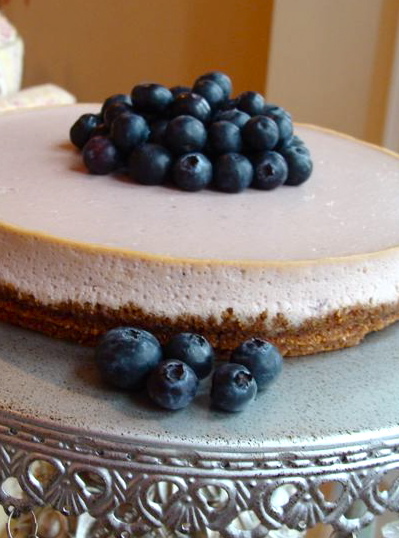 >Beautiful cheesecake and whole idea of including goat cheese is fantastic. >What a gorgeous cheesecake! I am so impressed that it is goat cheese and blueberry. I bet it is creamy and delicious! >Cheesecake is by far my all time favorite dessert, and yours might be the most beautiful I have ever seen! Yep, I am ready for Fall too! >Your mix of flavors here is heavenly. This recipe is a keeper. Stunning picture also, reminding me I need to get a better cake stand.. I love fall clothes, I am looking forward to the change in seasons. >What a great treat! I am just amazed at what you can do with goat cheese! >I love what you are doing with goat cheese, delish! I stumbled this! >First, I must say that I too was excited today when I saw the pumpkin-favored coffee drinks at Dunkin Donuts today! Second, this recipe sounds delicious! I started making cheesecakes last fall, and I would definitely be interested in this recipe. I hope mine looks as pretty as yours! >Gorgeous! I love love goat cheese this gelato place near me does a goat cheese with cocoa nib that I love. This looks great! >I am definitely not sick of goat cheese! This cheesecake looks amazing. >I've never heard of a goat cheese cheesecake, this is great. And where on earth did you find that gorgeous stand? >This looks delicious, I loooove goat cheese! >When I first saw your title I thought "you've got to be kidding me! Have I died and gone to heaven?" Honestly, I canNOT wait to try this. I want to run home now!! >Sick of goat cheese, never! I made something similar a while back but it was in a bar form. Your cheesecake looks great to eat and to look at! >This sounds so flavorful and decadent. I have seen goat cheese used in several cheesecakes lately, I must try soon! >This dessert says comfort food in the most elegant manner. It is definitely needed at a time when summer sandals must finally be put away and the boots dragged out in prep for winter. Sigh! Congrats on the Top 9! >I love goat cheese but I always use it in savory recipes or I should say right off the spoon. This looks wonderful! >I love your goat cheese creations. Please don't stop! >Amazing mix of flavors in this cheesecake. It looks divine. >Congrats on the Top 9 today! That's such an exquisite cheesecake to go on your beautiful cake stand. i love all the mix of flavors, and the stunning pic. i, too, am torn between summer and Fall, but Fall get my vote now. Bring on the sweaters and apple cider. >I looooove goat cheese too. I'm gonna have to try your goat cheese blondies, AND this cheesecake. Yummmm-my! >Wow! What a beautiful cheesecake. I'm not a cheesecake fan but you made such a creative one that I have to try your recipe. Congrats on top 9 and thanks for sharing your recipe. >I have that exact feeling as you! Can't wait for autumn, don't want to leave summer! >I'm with ya on holding on to summer! It's finally just getting warm around here but still there's that familiar tug of fall in the air. Oh and your cheesecake is absolutely stunning! Love love Love the goat cheese!! >I am a huge fan of goat cheese cheesecake. I made one with a blueberry orange topping made with canned blueberries so that I could serve it around the holidays and it was a hit. I LOVE your photo and the pedestal cake plate. GORGEOUS! >What a great presentation! I'm fascinated by using of goat cheese and amaretto as flavoring. Congratulations! >It must be really delicious…I love goat cheese and this looks gorgeous! >This cheesecake looks amazing. The goat cheese is a terrific addition! >I love chevre cheesecakes! This sounds wonderful, and the blueberries are so good this year! Beautiful as well! >OH my GOSH I LOVE LOVE LOVE goat cheese too. Have you ever had Fleur Verte goat cheese from Whole Foods? If you are ever there, definitely ask for a sample, it is the BEST goat cheese I have ever had, and I think I've tried them all lol. >Me! Me! Me! I love goat cheese, and this cheesecake looks amazing!!! >I love what you have created here…using goat cheese for cheesecake..that is so looking out of the box creative..sure looks fantastic, I can imagine tasty as well! >Anyone that is sick of goat cheese is no friend of mine! I hope that this doesn't mark the last of your goat cheese recipes for the year since summer is on the way out! Great looking cheesecake! >oh man…a cheesecake made with goat cheese & blueberries?? be still my heart! this looka amazing! !